Having been established by the Dutch in 1672, Somerset West is steeped in history. Today, there still exist homes and farmhouses that reflect the old Cape Dutch style, some of which have been meticulously preserved for the sake of tourism and heritage. The Helderberg (meaning ‘clear mountain’) is a range of magnificent mountains that dominate every scene and vista around Somerset West. It is this mountainous scenery, as well as the backdrop of the ocean, just 10 kilometres away, that lend Somerset West a particularly picturesque quality that is not readily evident from the main road. The Vergelegen Wine Estate is arguably this town’s best-known attraction. It was established some 300 years ago and retains all of the elegance and grace for which it has gained acclaim. This estate continues to be a working wine farm that produces world-class wines. It also has a restaurant, which offers delectable dishes that match the wines with which they are savoured. The farmhouse has been converted into a museum to complete the experience. The wine tasting centre and cellar are both open for tours and samplings of the top-notch produce of Vergelegen. The Helderberg Nature Reserve is another popular must-see during your time in Somerset West. This reserve covers an area of more than 360 hectares and is home to an array of the faunal and floral species that make South Africa so exquisite. 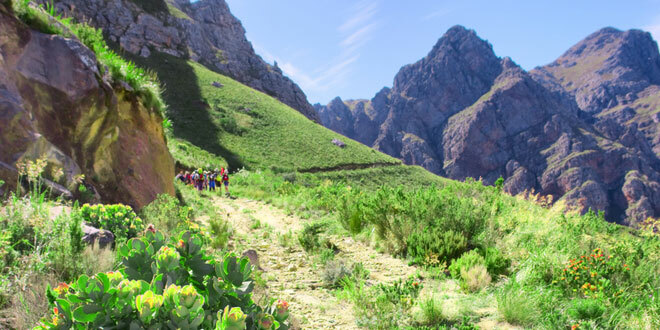 Not least of all, this area showcases stunning fynbos and proteas as well as medicinal plants that have been used for generations. Hiking and walking trails are the perfect way to enjoy the beauty of the region. A gift shop ensures that you will be able to purchase a special keepsake as a reminder of your Helderberg experience. There are picnic spots available, as well as the Oak Café Restaurant, for the ideal retreat after exploring the splendour of the reserve. • The Playhouse Theatre for an evening of theatre and dancing. • Somerset West Mall – a sizeable centre with an enormous variety of shops, supermarkets, boutiques, coffee shops and restaurants. • Lwandle Migrant Labour Museum – this is the only preserved migrant labour hostel in the province and exposes some of the horrors of a sad period as well as the victories that emerged as a result. • The Helderberg Veld Winkel-Mark is a market that showcases local produce, arts and crafts.